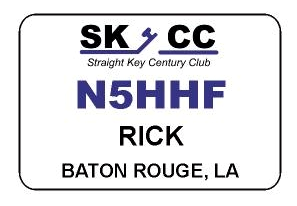 The Straight Key Century Club (SKCC) is the fastest growing group of mechanical-key CW operators in the world. First organized in January 2006, our club has grown rapidly to include thousands of licensed amateur-radio operators from all corners of the globe. -- SKCC numbers are issued for life. Once you get it, it's yours. -- Exchange numbers using a straight key, bug, or side-swiper. You can find the details of our key policy here. To receive an SKCC number, click on the Join SKCC link at left. If you are helping someone who wants to join but doesn't use email, you can download a snail-mail application here. To date, we have had a total of 32,856 Contacts. Visit the K3y Homepage for more information! 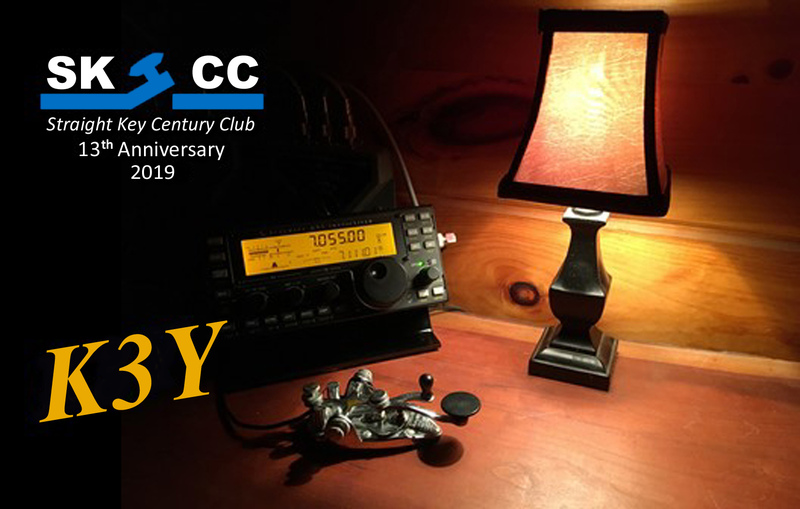 Congratulations to Bob, W2DL, SKCC 9702. He submitted the winning QSL design, Entry #1 Coincidently, for the 2019 K3Y QSL. Please see our K3Y QSL page for design Winners! Announcing a New SKCC Operating Award! The SKCC Triple Key Award! 100 contacts each with a Straight Key, a Bug, and a Side Swiper (Cootie)! For a Total of 300 Unique Member contacts. Only contacts made on or after November 10, 2018 count towards the award. Details can be found on the Triple Key Award Page. The March 2019 Newsletter Issue Has Been Posted! Please take some time to check it out. It can be found here. Under the "Member Services" section to the left. If you have not used the skimmer while chasing awards, you are missing out. Those last few contacts are always hard to find. SKCC Straight Key Night (SKN) occurs from 0000 - 2359 UTC on the first day of each month. It is not a contest, so there is no need to submit logs. But it is a good opportunity to work toward the club's achievement awards. The operating event, the club's first, was inspired by the ARRL's annual Straight Key Night. The SKCC's founders wanted to have Straight Key Night every month -- a good way to bring members together on the air on a regular basis. The tradition continues! Straight Key Sprint-Europe: Thursday, 4-April-2019, from 1900 - 2100 UTC with 15 minutes added on each end for QRS exchanges. Visit the SKSE Home Page for sprint details. The Monthly Weekend Sprintathon (WES) occurs on the Saturday following the 6th of each month @1200 through 2359 the next day (A total of 36 hours). Visit the WES Home Page for details. The Monthly Straight Key Sprint (SKS) occurs on the fourth Wednesday of the month and runs from 0000-0200 UTC. This means Tuesday evening in the US. Visit the SKS Home Page for sprint details. Are you new to CW? Then check out our CW Beginner's Corner page. It has plenty of basic information about CW operations that will help turn those first CW QSOs from jitters to joy. If you want personalized, on-air help, check out our Morse Elmers page. You'll find contact information for members who have volunteered to serve as CW mentors. Drop one an email to set up an on-air schedule. Or just visit the club's sked page. You'll see a list of members logged in and can use the page's messaging functions to reach a member to arrange an on-air contact. You have lots of help available to you as you become more adept at using the original instant-messaging mode! You'll find links to the Beginner's and Elmer pages in the navigation column at left under Getting Started. The link to the Sked Page appears under SKCC Community. Visit the club's sked site at https://sked.skccgroup.com. It's a fun, friendly place. New members and beginners are encouraged to join! No commands to learn, no Mickey Moussing around with new software. The system simply asks you to provide some basic info about yourself and, presto, you get a list of all SKCC members looking for some CW fun! Can't get any easier than that! A hearty "thank you" to Mark, K7MJG, for developing the sked page. A link to it also appears under SKCC Community in the navigation column at left. Looking for SKCC related software? Download club related software free. Programs like W5ZR's SKCC Awards tracker. If you are a software author and have club or CW related programs to contribute, please contact the webmaster@skccgroup.com See the Files and downloads under Member services at left. We have all faced the daunting task of firing-up the radio for that first CW contact. Now you can take that shaky, uncertain hand and turn it into a confident, firm fist with the help of our group of SKCC Morse Code Elmers. Simply click on the Morse Elmers link at left, choose from the list of Elmers, send him or her an email requesting a sked, and before you know it you'll be enjoying the thrill of sending and receiving solid CW. The SKCC Elmer Manager is Jeff K9JP. Can You Spare a Key For a Good Cause? Consider supporting the Halfway House for Keys program, run by a group of hams led by Michael Aretsky, N6MQL, SKCC 5051. The program provides free or very-low-cost straight keys, bugs, and cootie keys to young, newly licensed amateur radio operators who have shown an interest in using CW. The goal of the group is to keep Morse code alive and working on the air. All recipients are required to use their donated keys for at least one hour a week on the air, not just with a practice oscillator. They also are required to meet minimum guidelines to receive a key. If you have no keys to spare, cash works. You can donate directly though PayPal at halfwayhouse@pncengineering.com. All of the money collected pays for parts that have not been donated or for postage, which we pay if a recipient can't pay for it. NONE of the money is kept by the Halfway House members for personal use. If you have any questions about the program, would like to donate a key or parts, or would like to be considered as a recipient for key donation, please do not hesitate to email Mike at n6mql@arrl.net. So now you've joined SKCC, you have your mechanical sending device, radios, antennae, and other station accessories. But do you have the SKCC "look"? Here are some gift ideas you might think about when gift-giving/receiving time arrives. Why not stop by some of the vendors who are providing SKCC-related gear and do a little virtual window shopping? For an SKCC name badge, stop by the SignMan of Baton Rouge, purveyor of the SKCC badge shown at left. If you're interested in pinning one on your shirt pocket, you can order an SKCC badge here. If embroidered hats are your thing, visit Asterid's Embroidery and Quilts for a look at some au courant SKCC chapeaus! If you've got hair, complement it with a like-colored hat. If you don't have hair, well, protect that dome!